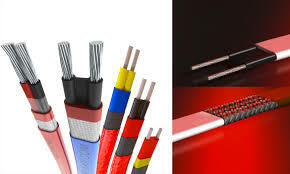 self-regulating heating cable are installed on pipes, roof and gutters.The heating cable replaces supply-pipe heating loses at the point where the heat loss occurs, thereby providing continuous, energy-efficient, temperature maintainance eliminating the risk of frost in cold seasons. Range of immersion heaters is suitable for heating all process fluids which are non-corrosive to the materials of construction. They are primarily intended for use in bulk storage vessels, flow heaters and hot water calorifiers. Ideal for generating steam and heating gases and liquids in pressure vessels and tanks, flanged immersion heaters are hairpin-bent tubular elements welded into a flange and provided with electrical enclosures.